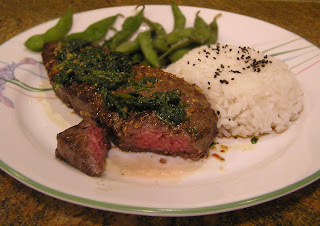 Here is a pretty quick recipe for a nice steak dinner. I used strip steaks, mostly because that's what I had on hand. Feel free to use another cut if you prefer. If the weather outside is not 43F and rainy, go ahead and fire up the grill. That would be my preferred way of charring these beauties anyway. To be fancy-schmancy, I packed rice into a small bowl, unmolded it then dusted with black sesame seeds. You can also use regular sesame seeds, but I like the color contrast. Remember, you also taste with your eyes. I made this very easy soup today in honor of the Chinese New Year of the dragon 4770, which starts this year on January 23. 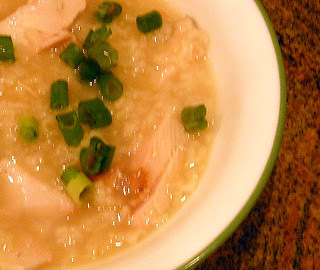 Basic congee is simply rice and water, cooked for an hour or until it breaks up and thickens into an oatmeal-like consistency. To give it more flavor, many recipes call for cooking the rice in broth and kicking up the flavor with a little soy sauce, sherry and poultry or meat. Omit the dead animal and use veggie broth or more water for a vegan version. Since the rice needs to cook for such a long time, I used canned chicken broth and leftover chicken to speed up the process a tad. If you prefer all scratch ingredients, first add a couple extra hours to the prep time, then make a batch of chicken soup before proceeding with the rest of the recipe.